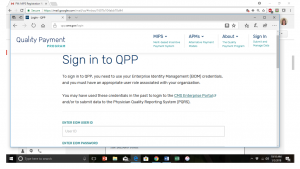 Have You Accessed the CMS QPP MIPS Data Entry Portal Yet? Do You Have an EIDM? A new voluntary episode payment model, Bundled Payments for Care Improvement Advanced, has been announced by the CMS. This will test a new iteration of bundled payments for 32 Clinical Episodes. BPCI Advanced will qualify as an Advanced Alternative Payment Model (APM) under the Quality Payment Program. Read more here. Have You Sent Your Selected Measures Baseline Data to VCSQI Yet? By February 2018 all TCPI enrolled practices should have a data strategy in place, should be using data to direct and improve care, and should be sharing performance data monthly with your Practice Transformation Advisors even if you do not have a functioning electronic health record system. You need to establish baseline metrics and create a plan to achieve higher quality and reduce costs and start making progress towards achievement of the 7 Aims as a QPP participating practice. Eddie Fonner and/or Ivan Berkel will be asking you for aggregate baseline data for each of the metrics you’ve decided to use in the TCPI project. Please respond to them as soon as possible. Baseline data should represent a time period prior to the start of your improvement activities with VCSQI. A clinician is eligible to participate in MIPS if in 2017 the clinicians saw at least 100 Medicare beneficiaries and billed at least $30,000. (Clinicians include physicians, chiropractors, podiatrists, dentists, optometrists, nurse practitioners, certified registered nurse anesthetists, and physician assistants). If you do nothing (no data submission), you will receive a negative 4% adjustment for 2019. You can secure a neutral payment adjustment for 2019 simply by either entering ONE data point for ONE patient ONE time, or by attesting to one quality improvement activity. To secure a positive adjustment, you need to submit more data through the QPP portal. Click here https://qpp.cms.gov/ to land on the home page for the Quality Payment Program (it shows a female clinician talking with a female patient). In the upper right corner is a ‘Sign In’ section. Once you click there you will see that you need a user name and password – and EIDM number. There is a link further down on this page to assist you if you need this number. You may already have one if you have previously participated in PQRS. We can help you if you need further clarification on the data to enter by the end of March. On behalf of CMS, an independent research firm (Mathematica Policy Research) that serves as the Evaluation and Analysis contractor for TCPi is conducting a survey of practices to support national-level program evaluation and improvement. If you see an email from Mathematica about the survey over the next few weeks, it means you were selected randomly to participate in a 15-minute online effort. Every response is important, because we know practices’ experience with TCPi (through VCSQI) and practice transformation differ a great deal by type of practice, size, market, and other factors—don’t let the voice of practices like yours be left out of this important feedback to CMS! (The sampling is statistically-based to be representative of the program, so only sampled practices may participate.) Thank you for your cooperation. Link to Fact Sheet: TCPi Evaluation 2018 Practice Survey Fact Sheet. The first meeting of the Opioid Management Workgroup was on January 25th. Debbie sent minutes and materials to point persons of all enrolled practices. You can access the recording of the meeting here. Recording of the Opioid Workgroup Discussion on Jan. 25, 2018. The next meeting is February 22, 1-2 pm ET. The first meeting of the VCSQI Person and Family Engagement (PFE) Workgroup is scheduled for February 7th (1-2 pm ET) and will continue to meet the first Wednesday of the month at the same time. Debbie has sent series calendar invitations for both workgroup calls to the point person of each participating practice. Please forward these invitations to other staff who your practice has identified to participate. 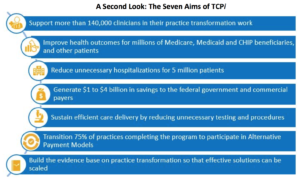 TCPI Aim 5 – Reduce Unnecessary Testing: Fully engage patients and families in transformation work that fosters reduced unnecessary testing and procedures. The Choosing Wisely campaign provides resources to engage in meaningful conversations about imaging, medication, and cost. To further awareness of the campaign among clinicians and patients, the ABIM Foundation has launched a Choosing Wisely app. 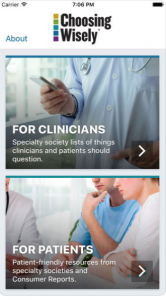 The new app makes the over 500 specialty society recommendations available at the touch of an iPhone screen. Through the new app, clinicians are able to search the recommendations using keywords, as well as filter by specialty, age, setting and service (e.g., imaging, medication, treatment, lab, test). Patient materials are organized similarly, by health topic (e.g., “common cold” or “back pain”), medical specialty, society and age. The recommendations are linked to any relevant patient-friendly resources, and both can be shared via text or email with colleagues or patients. Read more about Choosing Wisely here. 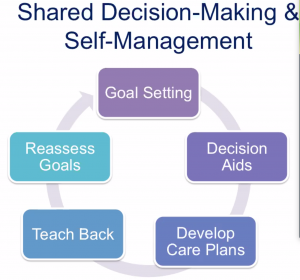 Here’s the one-hour VCSQI Sponsored webinar with Mary Minniti, BS, CPHQ, Senior Policy & Program Specialist from the Institute for Patient and Family Centered Care (IPFCC) addressing patient activation through development of confidence, knowledge and skills, and care team processes for person and family engagement to achieve greater health activation in self-care and medication management. View January 16, 2018 presentation video recording on YouTube here. Link here to Compendium of Resources for Health Activation referenced in her presentation. 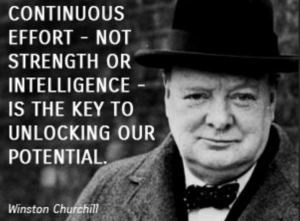 Link here to join pfcc.connect@pfcc.org to join discussion and share best practices and success stories. Visit the InsigniaHealth.org website Ms. Minniti recommended for more patient activation information. Click here to join or log in to the Healthcare Communities website and check the calendar for a full list of webinars and learning sessions. CMS announced the results of the 2018 Value Modifier and the adjustment factor that will be applied to clinicians receiving an upward payment adjustment. In 2018, over 20,000 clinicians will receive an increase of 6.6% to 19.9% on their Medicare physician fee schedule payments as a result of their high performance on quality and cost measures in 2016. The 2018 Value Modifier results and the payment adjustment factor are available on the 2016 QRUR and 2018 Value Modifier webpage. The Value Modifier payment adjustment ends in 2018. The Merit-based Incentive Payment System under the new Quality Payment Program is replacing the Value Modifier. A video presentation is available for the October 19 webcast on the 2016 Annual Quality and Resource Use Reports (QRURs). This event provides an overview of the report and explains how to interpret and use the information. Data is essential for quality measurement. Selecting the best source(s) of data for a quality measure is critical. For more information on data sources, see the full article on the MMS website. CMS has implemented an innovative tool that provides enhanced visibility into the portfolio of CMS measures. Read more about this tool here. VCSQI has outlined a TCPI Transformation Roadmap to methodically guide a practice through the 5 phases of transformation. The Roadmap outlines specific activities of our work with you, including the initial preparation. 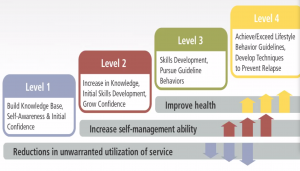 Ivan Berkel, VCSQI Transformation Improvement Advisor will help guide you through the phases. The goal of the VCSQI SAN 2.0 is to assist participating practices progress through the 5 phases of the Quality Payment Program (QPP) practice transformation process. Starting with review of your baseline practice assessment, we will guide you and your practice leaders through practice improvement activities and changes. Our goal is to successfully keep your practice moving from one phase to the next to optimize your CMS reimbursements in the QPP, and improve quality, reduce costs and focus on patient-centered care. To see all VCSQI SAN 2.0 Participating Practices, click here.